ORLANDO – Rory McIlroy’s homeland is known for its whisky, but Arnold Palmer drank vodka. So the 28-year-old from Northern Ireland raised a clear glass following his post-round interviews at Bay Hill and gave a brief toast. Not long before that, McIlroy downed a 25-foot putt to secure his victory at the Arnold Palmer Invitational with an 18-under,270 total for the week. He shot 8-under 64 in the final round and birdied five of his final six holes to top Bryson DeChambeau by three strokes and win for the first time since the 2016 Tour Championship. With recent wins from Phil Mickelson and Justin Thomas, and Tiger Woods’ promising return, it seemed McIlroy was trying to prove a point, reminding everyone that he’s still very much in the mix with the Masters just three weeks away. McIlroy began the day two shots behind 54-hole leader Henrik Stenson, who finished fourth at 13 under after shooting 1-under 71 in the final round. Justin Rose finished solo third at 14 under, and Woods was T-5 at 10 under. Woods shot 3-under 69 and briefly got within one shot of the lead after a birdie at 13. But he faltered late with bogeys on two of his final three holes. That makes three consecutive top-12 finishes for Woods after a T-2 at the Valspar Championship and T-12 at the Honda Classic. “If you would have (told) me at the beginning of the year that I would have had a chance to win two golf tournaments, I would have taken that in a heartbeat,” Woods said. McIlroy, Woods, Mickelson, Thomas – all of the big names seem to be peaking in mid-March to set up the most anticipated Masters in recent memory. Even two-time champion Bubba Watson won last month’s Genesis Open after a miserable 2017. 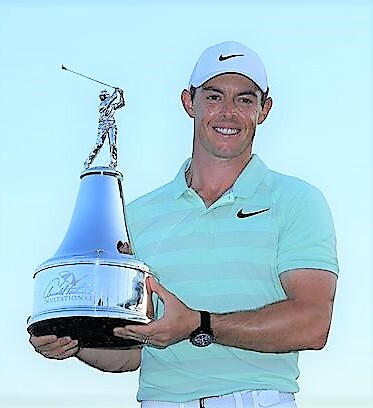 Here’s another reminder – McIlroy is the only one who can complete the career Grand Slam when he heads to Augusta National, with other current hopefuls Mickelson and Jordan Spieth having to wait for the U.S. Open and PGA Championship, respectively.